Hi, I’m Mariela Dabbah and I have a Superwoman complex. Yeah, don’t laugh. Most likely you have it too! 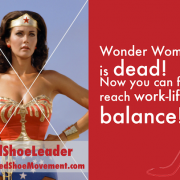 Why does work-life balance seem so far fetched? Our inability to reach a comfortable work-life balance may be the result of a very old mandate many women were raised with: to be perfect. Passed down from generation to generation and etched into our subconscious with a bit of help from ubiquitous media messages, this mandate calls for us to keep all the balls in the air like perfect jugglers. It begins very early in our lives and it has no connection to work-life balance. Women are expected to play outdoors yet remain spotless; to get straight As in school while helping with younger siblings and helping around the house; to go to college and work full time – all things that are usually not required of boys. And then we don’t understand why men can’t multitask! You can do anything! 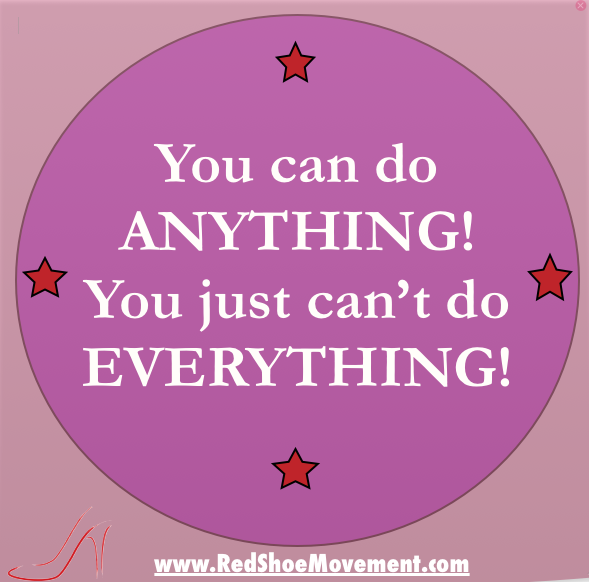 You just can’t do everything! I’m not a therapist, but I’m pretty sure that the Superwoman complex and the long-held notion that we can multitask are not doing us any favors. Science shows that the brain can only focus on one task at a time. So when you multitask, in reality your brain switches back and forth from task A to task B. Although you think you’re doing things faster, you are actually slowing down while increasing the risk of making mistakes. Unfortunately, there are harsh consequences for perpetuating the notion that women are better at multitasking than men. Our husbands, partners and colleagues are glad to let us display this wonderful trait while they use their free time to improve their own work-life balance. 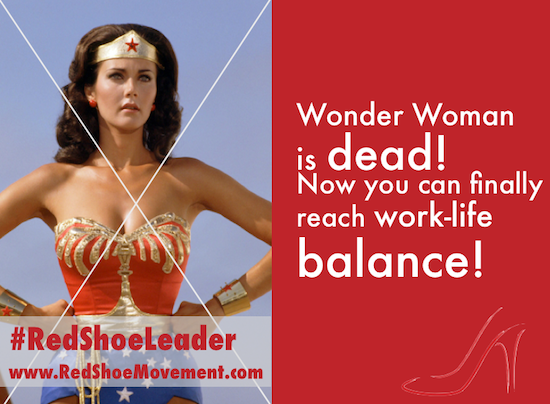 Work-life balance? I’m a magician; I get it all done! Pretending we can do it all – or like a woman recently said at one of my presentations: “I’m a magician; I get it all done!” – takes a toll in our quest to achieve work-life balance. Because guess what? You are not a magician. You can’t do it all and, in the end, the stress will impact your health. Personally, when it comes to creating work-life balance for myself, there are times when my professional life takes over and I eat, breathe and sleep around my work schedule. But because I don’t have a boss, I can swiftly tilt the work-life balance scale in the opposite direction and take a day off in the middle of the week or go away for two weeks to recharge. Not everyone has the same luxury, but you can, however, follow these steps to get closer to a decent work-life balance. Admit that you love power. But rather than holding on to the power that you derive from keeping control of everything that happens at home, seek power in your career. The need for perfection, for keeping tight control of all aspects of family life, takes away your power to say “no” to responsibilities that someone else can take on. Learn to say “no”. “No, I can’t pick up the dry cleaning.” “No, I can’t come up with the name of a good restaurant for your office meeting.” “No, I can’t prepare dinner every night.” It helps to start small and to slowly pass on the responsibilities to the different members of your family or the people around you (your children, parents, housekeeper, etc.). Empower those around you to assume responsibilities. Because everyone is used to you doing everything (the Superwoman brand will haunt you for a while! ), your family members need to be “trained” to assume duties that you give up. Enroll their help by explaining that you’re seeking to reach a more acceptable level of work-life balance. With the right guidance and encouragement, you’ll be surprised at how eagerly they fulfill their new obligations even if there’s some push back in the beginning. Learn to make do with “good enough.” When it comes to non-critical aspects of life, you should “outsource” the task or responsibility. The only way to achieve work-life balance is to give up trying to do everything yourself. Whether it is food shopping, planning vacations, cleaning the house, cooking dinner, or dressing the kids in the morning, you must get used to things being less than perfect. It doesn’t matter that the kitchen looks better when you clean it if now you have more time to pursue your career goals or to have lunch with a friend. Praise those who help and support you. Don’t criticize your husband for picking up the wrong brand of toilet paper when he does the grocery shopping. Charmin or Northern should make no difference when the goal is that both of you can achieve a more even work-life balance. Thank and praise your children when they do the dishes, or use their smart phones to plan the next family outing. Who cares if you end up on a Six Flags roller coaster when you would’ve rather gone to the beach. You didn’t have to plan it! 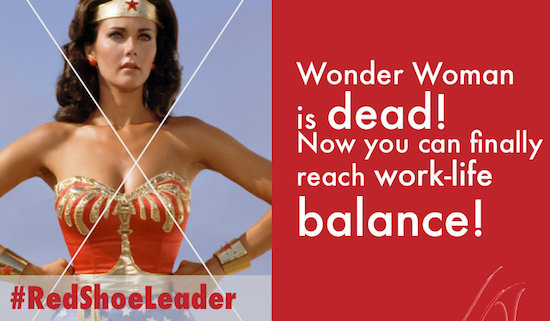 The moment we admit that we are co-creating the myth of the modern Superwoman, we can drop the act. We can relax and use the freed-up time to focus on our career goals and on ourselves. We can stop trying to be magicians and we can finally drop the balls that no human being should ever be asked to keep up in the air. And don’t forget to lead and inspire women in your organizations! 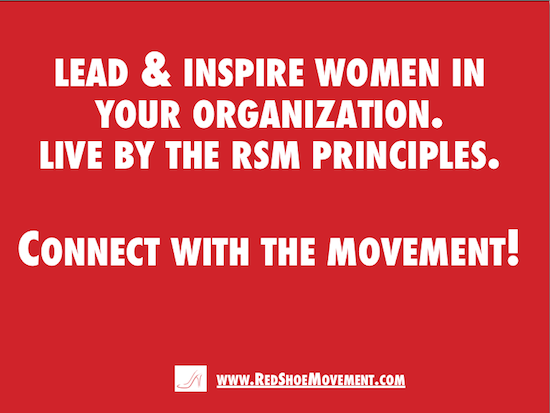 Live by the RSM Principles! Corporate Mentor, Career Sponsor: Distinctions Matter What is a CV? Wonder no more!